Jacketta Sweeping Service "Does Sweeping Right"
"When I was growing up," recalls Jacketta, "it was easy to provide my friends with directions on how to get to our house. I would just tell them to drive down our street until they saw sweepers sitting outside a house." After she got out of school, Debbie worked elsewhere rather than getting involved in the sweeping business. This worked fine until she had her first child, when the ability of being able to take the baby to work at the family business became an attractive benefit. She started working as the bookkeeper a couple days a week to give her mother a break away from doing it. Before long, keeping the books became only fraction of her job description. As it was under her father's direction (Neil passed away in 1999), today Jacketta Sweeping Service emphasizes the core business of power sweeping, rather than branching out into other pavement related services. The exception to that is the service they provide with their scrubber, which gives the company the ability to handle smaller, parking garage-type cleaning. The rest of the business is split between parking area sweeping and street sweeping, with about 80% of total services falling into the category of street and construction work. The latter includes a significant amount of cleanup during milling operations. 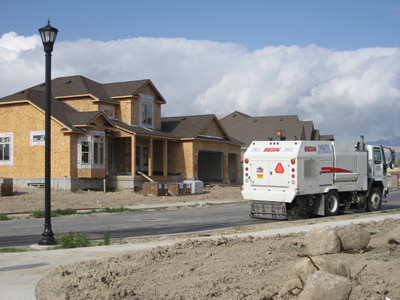 The company offers a mix of broom and air machines of all class sizes, so that allows them to target each job with the most efficient type of sweeper for the job. Debbie is an annual "fixture" at the National Pavement Exposition and has been involved with working to improve the sweeping industry for many years. Today, she serves on the Board of Directors of NAPSA, and is also a past president of the Association back when it was called the Contract Sweepers' Institute. 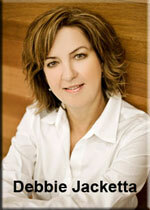 Debbie can always be counted on to speak with new contractors and help them however she can. Jacketta Sweeping Service also is a member of IREM and BOMA, and has found that to be good business for them through the years. "Although it seems more and more like the meetings are largely attended by vendors, we still gain business through the organizations," said Jacketta. "When you belong to membership associations like that, is avoidant to go to the monthly meetings and to mingle around and talk with the different other people in attendance. Then, when they are looking for a sweeping contractor you will at least be in consideration for a bid." When asked about the current business climate in Utah, Jacketta said that for her company it has been a good year. "In the last couple years there has been a sweeper or two in our fleet though we didn't even bother to license," she said. "This year all of our sweepers have been out on jobs much of the time, which is definitely an improvement." 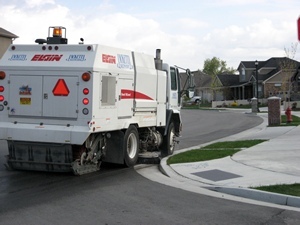 The company uses a GPS system for its sweepers. In addition to the standard reason for doing so, sweeper tracking, Jacketta cites the ability to do better routing as another big plus to the system they use. "We have found that we can not route our sweepers as well as our GPS system enables us to do," said Jacketta. "With the price of fuel these days any advantages in routing can add up." When they first got the GPS system, she related, only one employee voiced much opposition. Then, once the GPS was installed and operational, that person turned out to have spent an hour at his house the very first night. "It became clear that, even though he was opposed to it, he didn't really understand how well it would work and that we would see a report of him being at his house. 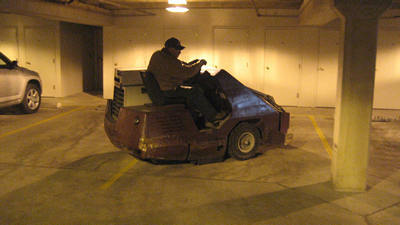 Of course, he said it was the very first time he had ever gone home while on the job..."
For more about how Jacketta Power Sweeping operates from its location in the outskirts of Salt Lake City, Utah, including information not covered here, you are invited to listen to the approximately 25-minute audio interview with Debbie Jacketta. Note: The audio interview with Debbie Jacketta will play without downloading any files onto your computer. If you hear the interview at 'chipmunk speed,' you will need to download the latest version of Adobe's free Flash player. Debbie Jacketta may be reached via email sent to debbie@jackettasweeping.com. You may also reach them by calling 801-973-6976. The company's website is located at www.jackettasweeping.com.